The Cazenovia Opera House was first acquired by the College in 1968. Almost 40 years later, the Catherine Cummings Theatre, named after 1925 alumna Catherine Cummings, continues to contribute to the academic programs of Cazenovia College, its co-curricular activities and the cultural life of the surrounding Cazenovia community. A vital historic landmark, members of the college and surrounding communities enjoy the many cultural events, lectures, plays, musicals, meetings, theatre camps, and fundraisers that take place in the theatre every year. 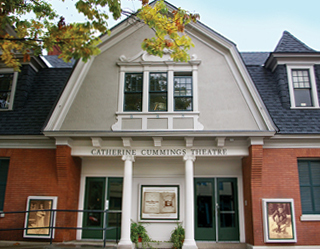 The Catherine Cummings Theatre hosts such annual events as Jazz-N-Caz, the Cazenovia Chorale Holiday Concert, the Caz College Kids Theatre Workshop, as well as the College's fall and spring productions directed by Artist-in-Residence David Lowenstein. > Visit the Theatre's Events Calendar for a complete listing of upcoming events. We recently launched the Take-A-Seat campaign to raise funds in support of programming for the Catherine Cummings Theatre. > Visit www.cazenovia/take-a-seat for more information.